If you are a family caregiver providing daily assistance to an aging loved one with Alzheimer’s disease or another form of dementia, you might find that some of the regular challenges you face leave you feeling drained, confused and frustrated. You might not know where to turn for help, or if there’s even anything anyone can do to help you. This is exactly where a dementia caregivers support group comes in, offering you reassurance, holding you up and helping you withstand those challenges. A support group can supply the right information you need during trying times in your caregiving journey, while you also find camaraderie and build friendships with others sharing similar experiences. According to the Family Caregiver Alliance, in 2015 over 43 million Americans provided unpaid care to an adult or child. Of those family caregivers, 15.7 million cared for a loved one with Alzheimer’s disease or another dementia. These family caregivers help with tasks like shopping, grooming, mobility issues, medication management and more. After a loved one is given a diagnosis of dementia, you can expect that life will change for all parties involved. Your loved one must accept the fact that they’ll be facing serious changes to their memory and overall health. As a family caregiver, you must learn to properly manage your time, deal with the emotional and physical stress involved and even be prepared for the possible strain on your household finances that your caregiving duties can cause. Additionally, dementia caregiving often involves challenges above and beyond simply assisting loved ones with daily living activities. Providing care to individuals with dementia means family caregivers also must deal with behavioral expressions like wandering, sundowning, extreme changes in personality, repetitive actions, confusion and more, which can be much more demanding over time. Throughout the country, Alzheimer’s or dementia support groups are available to provide an opportunity for caregivers to come together, share experiences and connect with others. These groups are often held in community centers or churches, hospital conference rooms, or even public locations like parks or libraries. Online dementia support groups are also available for those family caregivers who find it difficult to leave their loved ones alone for any amount of time. Finding ways to cope with caregiving challenges. 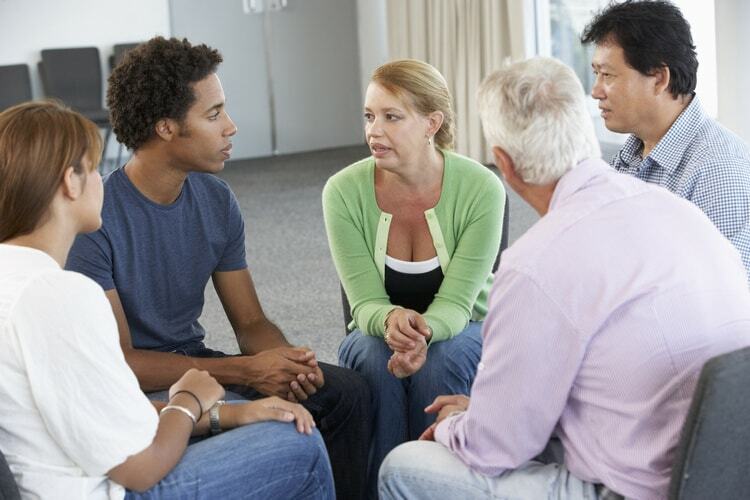 Talking to others in the support group offers opportunities to learn new coping strategies for your caregiving journey. You’ll be able to discuss solutions to common issues and learn what worked best for others. An opportunity to share similar experiences. You’ll meet individuals who probably experience very similar situations day-in and day-out. Just talking about them provides peace of mind and can lead to you being a better caregiver. Additionally, you’ll receive validation that those feelings you’re having like you’re the only one who is dealing with a difficult caregiving situation, will be put to rest. A chance to help others. In a dementia support group, you’ll be able to help others while receiving the assistance you need, too. Think of everything you’ve learned as a caregiver – chances are those skills you’ve acquired can be shared to help others. Reassurance and affirmation. Support groups can provide reassurance that you aren’t a bad person if you seek time to take care of yourself and attend to your own needs. You’ll receive the affirmation that there’s no need to feel guilty about leaving your loved one in the capable hands of others from time to time. Building lasting relationships. Caregivers often become so involved in their caregiving duties that social isolation is a problem. A support group provides not only a way to avoid the isolation that can lead to loneliness and depression but a chance to meet new friends with common interests. Find dementia caregiver support at Peabody Retirement Community. Join us the third Thursday of every month in The Frank and Laura Smock Memory Enhancement Center for our Alzheimer’s/Dementia Support Group, led by our chaplain Sue Babovec. Peabody also offers personalized Alzheimer’s and dementia care at The Frank and Laura Smock Memory Enhancement Center. Residents enjoy structured activities designed to enhance their senses and their memories in a homelike, secure environment. For more information about memory support at Peabody, please contact us today.